HCM CITY (VNS)— Since February of this year, local coffee markets in the Central Highlands and the southern parts of the central regions of Viet Nam have experienced a rush on sales as coffee prices rise. On Wednesday, coffee was selling for VND40,500 (US$2.2) per kilo, VND1,500 per kilo lower than the prices laid out a week earlier, but they are VND7,500 per kilo higher than on January 2 of this year. On Thursday, in the Central Highlands, coffee prices dropped again slightly to VND40,000 per kilo. "When the prices reach VND40,000 per kilo, traders like to sell at least part of their stock to avoid risks they may face if coffee prices drop," a coffee trader in Buon Ho Town of the Central Highland province of Dak Lak, was quoted by Sai Gon Tiep Thi (Sai Gon Marketing) newspaper as saying. 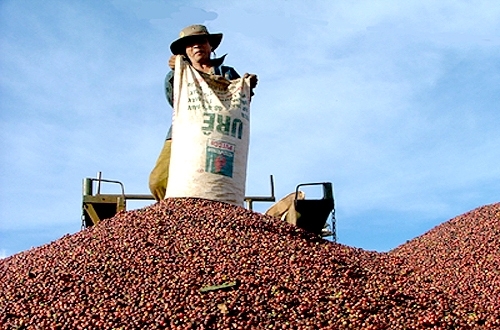 A coffee exporter from the southern province of Binh Duong said he bought between 3,000 and 4,000 tonnes of coffee beans per day, but this is only half the amount he purchased earlier in the year when coffee prices reached their peak. Coffee prices have risen globally due to a serious drought that has been threatening the coffee crop, mainly arabica coffee, in Brazil, the world's No 1 coffee producer and exporter. According to the Brazilian Coffee Exporters Council (CeCafe), Brazil exported 2.51 million bags (each weighing 60kg) of coffee beans in February 2014. This figure includes over 143,000 bags of robusta coffee, a 24.2 per cent increase compared with January of this year and a 273 per cent increase over the same period in 2013. Between July 2013 and February 2014, Brazil exported 19.66 million bags of coffee beans, a 8.8 per cent increase compared with the previous coffee crop. Viet Nam is the second largest coffee bean exporter but the No 1 exporter of robusta coffee. According to the National Customs Bureau, in February 2014, over 184,000 tonnes of coffee beans were exported from Viet Nam, a year-on-year increase of 83.4 per cent. In the first five months of 2013-2014, Viet Nam shipped 604,200 tonnes of coffee beans, down by 15 per cent compared with the previous coffee crop.